BERJAYA Land Bhd's (BLand) The Great Mall of China (GMOC) is set to outdo others for the bragging rights as the world's largest shopping mall. And BLand has every reason to be confident of GMOC's success, particularly in 'terms of demand for space leasing' as Beijing has high per capital income of US$12,447 (RM39, 200) in 2011. By the World Bank's standard, cosmopolitan Beijing is already considered a wealthy city, on par with London, New York or many other rich cities around the globe. 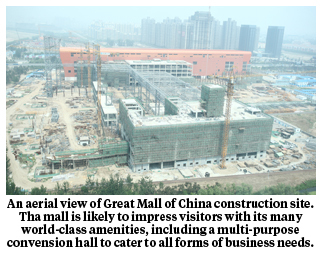 GMOC, the world's biggest integrated mall complex, is estimated to be worth about RM7.5 billion on a 32ha site in China's Hebei Province. It is expected to be completed in five years. GMOC has strategically positioned itself in an area where massive integrated public transportation project is due to take place. One notable project is a big subway station, which is expected to be completed in 2018, linking it to neighbouring TongZhou. TongZhou is about 20km away, and the subway will bring its distance to GMOC within 2km, reducing travel time to mere minutes from half an hour now. Beijing's population of over 21 million people, excluding the population of its neighbouring cities such as Tian Jin, Hebei and Yan Jiao, which are also booming due to the country's sound economy, is expected to give rise to the project's popularity. The vision for such a project of epic proportions is a timely investment by the Berjaya Group founder Tan Sri Vincent Tan. Tan owns 49 per cent of BLand's subsidiary and GMOC operator Berjaya Great Mall of China Co Ltd (BGMOC) through Berjaya Times Square Cayman Ltd.
GMOC was planned at a time the Chinese market began witnessing a boom followed by the gross increase of the republic citizens' spending power worldwide. Tan definitely knows his market. The Berjaya Times Square, which is the eight largest building in the world in terms of floor area, is proof of the conglomerate's big dreams and visions. Unlike other shopping malls in Beijing, which are mostly purely shopping driven, GMOC will be the first to break out of the ordinary shopping culture in China by housing three indoor theme parks. GMOC will also impress its patrons with its many world-class amenities, including a multi-purpose convention hall to cater to all forms of business needs. With Phase One due to be completed in October next year boasting of three all-weather and indoor theme parks namely Extreme Park, Family Park and Water Park, GMOC is poised to set the Malaysian flag sailing high globally. 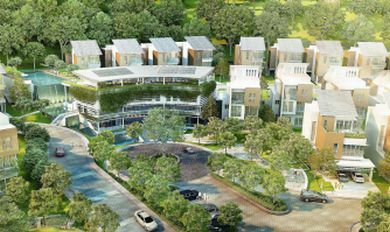 Green, green homes: Artist’s impression of an aerial view of Sunway Rymba Hills. Gross prices range from RM4mil to RM4.9mil per unit. SUNWAY Bhd's concept of integrating the beauty of nature with stylish architectural designs amid a low density gated and guarded community is a popular draw with well-heeled property buyers. 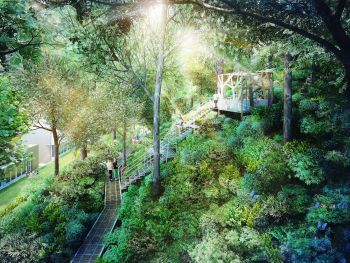 Both the property and construction company's Rymba Hills in Sunway Damansara and Sunway Montana @ Desa Melawati feature sizeable private forests and well-planned park-inspired environments that adopt the LOHAS (lifestyles of health and sustainability) concept. Sunway Rymba Hills, which is a joint venture with Selangor State Development Corp (PKNS), consists 80 units of leasehold three-storey villas on 19.72 acres in Sunway Damansara, Petaling Jaya. The villas have standard lot sizes of 45 x 90 ft, and gross built-ups ranging from 4,442 to 4,650 sq ft. Gross prices range from RM4mil to RM4.9mil per unit. 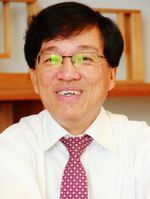 The group's managing director (property development Malaysia) Ho Hon Sang tells StarBizWeek that Rymba Hills' 6.5-acre private forest park forms the character of the residential development. Rymba Hills also has nature trails, meditation pavilions and exercise par courses. All hillside villas are designed to look outwards towards the forest park, or the landscaped strip gardens. Ho points out that Rymba Hills, which has its name derived from the Malay word meaning “primary forest”, has only 4.1 units per acre. “It is very low density, in an area that is known for quite a number of high-rise residential developments,” says Ho. It is worth noting that had Sunway stuck to the original project plan for the condominiums, the gross development value (GDV) would have been between RM700mil and RM800mil (compared with the GDV of RM270mil for the three-storey villas in Rymba Hills). Ho: ‘Rymba Hills’ 6.5-acre private forest park forms the character of the residential development’. “Yes, we would have made a lot more money. But Sunway is always a responsible developer. We respect the environment, and the social aspect of development for this area. There are a few thousand condominiums around this area (Kota Damansara, Mutiara Damansara and Damansara Perdana). “So, when we decided to change the development plan to one with a much lower density, the authorities were only too happy to approve the conversion,” Ho recalls. Highlights of Rymba Hills, which is scheduled to be completed by end-2012, include a fully equipped clubhouse with a gym, recreational pool deck and infinity pool. Rymba Hills has eight landscape garden themes, namely nature trail, fruit orchard, herbal/kitchen garden walk, terrace nursery, jogging and par course area, deck and recreation pond, linear garden, playground and water cascade area. There are four villa designs, where Type A and D come with lifts. Type B has a contemporary design, with its entrance at the centre of the unit or the middle floor. Type C has a master suite (bedroom and dedicated pantry and study room) on the highest floor, linked to roof garden. Ecological design features include large balconies offer solar shading and anti-glare by way of their generous overhangs, while sun shading screens are placed on the north western part of the levation to screen off the strong afternoon sun. Building layouts are designed to facilitate natural and cross ventilation. Other passive thermal design strategies include the use of cavity walls for western facing wall, sun shading screens and use of insulation in roof space. The development was also given a provisional Green Mark Gold award by Singapore's BCA (Building and Construction Authority). “About 30% of the units are still available,” says Ho. Rymba Hills is located near colleges, hypermarkets, lifestyle neighbourhoods (such as Sunway Giza), commercial areas (Dataran Sunway) and shopping malls such as 1 Utama and The Curve. It is accessible via Damansara-Puchong Highway (LDP) and New Klang Valley Expressway (NKVE). Completed Sunway projects in the area include Sunway Sutera and Opal Damansara condominiums, Laman Impian garden villas, Challis Damansara and Parkview townhouses as well as Sunway Damansara Technology Park. Presently under development is Sunway Nexis, which is a commercial development consisting of three-storey retail shops with sizes ranging from 4,133 to 8,718 sq ft, 13-storey office suites with sizes ranging from 925 to 1,636 sq ft, and a 20-storey flexi office block. “The upcoming My Rapid Transit (MRT) station will be nearby, at Sunway Nexis @ Dataran Sunway. We have very strong take-up rates for Sunway Nexis,” says Ho. Meanwhile, the group recently launched the first phase of the 56-acre Sunway Montana @ Desa Melawati, Kuala Lumpur. Green splendour: Rymba Hills has nature trails, meditation pavilions and exercise par courses. According to Ho, the group was not too concerned about the perceived slowdown in the demand for mid-high and high-end residential properties this year, due to stricter bank lending guidelines. The last two weeks were rather sobering. There was this small 700 sq ft condominium unit that seemed rather promising for retiring in, priced at more than half a million ringgit. There were no steps to manoeuvre, no slippery floor tiles and the bath was elderly friendly. The project had all the merits for retiring in with nearby amenities. There was another unit, about RM800,000, which was about twice the size, which, from the start, was way beyond the radar of affordability. So off to the financiers. The first, after looking at the relevant documents, and assuming the purchase would be for the small unit, looked up and smiled broadly. Doable! The little heart smiled, relieved! Incidentally, according to ancient Chinese culture and beliefs, it is the heart that is the fountain of wise decisions - and bad ones - not the mind. That is why, the word wisdom (hui) is written with the heart symbol as its base, or root word. Unlike Romanised languages, Chinese is based on pictograms or pictures. So let's consider the second and bigger unit. Doable! That is shorthand for getting the bank's stamp of approval, that is, getting a loan would not be a problem. But wait! It will be a stretch after retirement, she cautioned. A second and third bank officer were consulted. Both gave an outright No! even for the small unit. They said it will not be right to earn the commission because they will not be doing their good turn for that day if they were to go ahead with the loan application. They want the good karma to remain with them. Both convey the same message not a wise purchase at all. So perish the thought. Before parting ways, they brought up several reasons why a property purchase was not the best decision. That was when the moment of truth came, which brought about the sobering effect. Being a bit defiant, another type of financier certainly not an Ah Long was consulted; a reputable lender, but one that does not come under the purview of Bank Negara's regulations. Incidentally, the most recent change in lending criteria when evaluating loan eligibility is based on the net income of applicants, and not the gross income, as was done previously. This new lending guidelines deduct all personal commitments which may include car and computer loans, personal and credit card loans. It also includes contributions to the Employees Provident Funds and other deductions. The loan application is based on the net figure. Another broad smile came from the fourth financier. No problem! Doable. Unfortunately, the terms and conditions were not attractive. At that point, the question was not how desirable the property may be, but how much does one want it? Does the end justify the means? The crux of this rigmarole is this, there are always ways to get around rules and regulations in order to have what we perceive as “our prize”. When it comes to the stage when one wants something at all cost despite the hordes of naysayers and the little barriers to entry, then maybe it is best to just walk away. A property consultant said he has come across clients who want to buy a property so much that they begin to take all sorts of risks. “Buying a property should not stretch one's resources to the point of having to give up the little treats in life,” he says. So, there goes the little 700 sq ft to somebody else! The saying “when there is a will, there's a way” does not sit well with deputy news editor Thean Lee Cheng. PROPERTY prices are a favourite subject for conversation among Malaysians. It is to be expected. Everyone is looking to buy a house or apartment, either to have a roof over his head or to sell it for a profit at some point in the future. To have a house or apartment of your own has become a must for most of us Malaysians today, a condition further encouraged by the Government's home ownership programme. On the face of it, this is a good policy. Everyone should be given the opportunity to have a place of his own, a home that offers a decent level of comfort and well-being, yet within his means. However for the average Malaysian, particularly those living in or around urban centres, the prices of property have risen so high that they can no longer afford to buy. As an expert in the real estate sector in Malaysia pointed out recently, the prices of homes in a city such as Petaling Jaya have risen more than 30 times in the past 40 years. In the same period, salaries have gone up a mere 10 times. As a result, people are now expected to downgrade from a landed property to an apartment, usually. Even so, people are paying more in monthly instalments and taking longer up to three times to fully repay their home loans. In short, if you buy an apartment today, you will probably spend the rest of your working life paying for it. As a result, they also end up paying a lot more in interest to the bank, compared with their parents or grandparents 30 or 40 years ago. Given that 76% or five million households in Malaysia have incomes below RM5,000 a month, many homes on the market today are priced beyond their affordability. In addressing this issue, the Government has imposed a quota for low-cost housing projects. Private developers are expected to chip in by setting aside a certain percentage of their projects for low or medium cost homes. More drastic measures have recently been proposed. For instance, the Kedah state government is mulling a proposal to require private developers to allocate up to 60% of their projects for affordable housing, up from 30% now. Over and above this proposal, the PAS-led government is also mulling the possibility of restricting the sale of property in certain districts in Kedah to Kedahans only. The state believes this move would reduce speculation on property prices, thus ensuring that houses remain affordable for Kedahans. Such proposals seem ill-conceived, to say the least. On the whole, be it at the federal or state level, a more strategic plan is necessary to meet the housing needs of those in the lower to middle income group. At the same time, there must be room for a dynamic property market where investors can expect some returns for putting money into property. Developers are well aware of the need to ensure that all Malaysians have equal access to housing that they can afford, and for the most part are supportive of any move to this end. However, it must also be noted that for developers, other concerns come into play when planning and deciding on new projects, such as types of houses, price range and location. As business entities, property development companies have to meet profit expectations of shareholders as well, and building homes and selling them at RM42,000 or below is certainly not going to help meet those expectations, especially in the urban centres where land costs are very high. Another consideration is mobility. For the lower income group in particular, the ability to get around for work, school and other daily necessities at an affordable price is essential. For the most part, it does not make sense for them to buy a low or medium cost home in a locality that is not served adequately by cheap public transportation to enable them to go to work or for their children to go to school. For them, buying a car may not be an option, and taking the taxi to work is a luxury many cannot afford. For these reasons, it makes sense for the Government to build affordable housing for the lower income group, with contributions to subsidise these projects funded by private developers. Developers would have had to spend money anyway if they are to meet the quota of affordable housing in their respective projects. The money would be better used if it is channelled to the Government for a more strategically planned housing programme. The Government could also ensure that the right infrastructure be put in place to ensure that those who buy into the low or medium cost homes that it is building also have access to affordable public transport and other facilities. With almost unlimited land bank, the Government could easily build a school within the development as well, thus meeting another essential need. By taking full responsibility for affordable housing, the Government could also ensure that they are well maintained. For the most part, low-cost apartments in Malaysia are not well maintained. If residents or owners fail to pay the monthly service charges regularly, there would not be sufficient funds to ensure proper maintenance. As a result, many of such apartment blocks end up looking like slums in just a few years. Any attempt to control property prices runs against the free-market concept that we practise. For most of us, even those who buy a house to live in for the long term, putting money into property is a form of investment. When we were younger and had just been married, we struggle to pay the mortgage for a house that we believe is reasonably big enough for our spouse and two or three children. When our children are grown up and on their own, we may decide to sell the house and opt for a small apartment instead. Hopefully the house would have appreciated in value and there would be a decent sum left for our retirement. Teh Lip Kim is the MD of SDB Properties Sdn Bhd, a lifestyle property company. Bouquets and brickbats are welcomed. Send by email to md@sdb.com.my. IPOH: MK Land Holdings Bhd will build more affordable housing next year to counter the potential recession, its chairman Tan Sri Mustapha Kamal Abu Bakar said. He said affordable housing was particularly saleable during recession and that the company would concentrate its projects in Selangor, Perak and Kedah. "We have gone through three recessions since we started 28 years ago and we are still around. The secret is to have a basket of projects," he said. Speaking to reporters after handing over keys to house owners at Meru Perdana here yesterday, Mustapha Kamal said the company would not concentrate on upmarket or commercial development next year. Although the focus is on affordable housing, the company will not compromise on structural integrity, sound proofing, termite resistance and quick completion. "I am not worried," he said when asked on how the company would face a possible recession. He added that only when the market recovers, the company would build more upmarket projects. "We own large land bank which allows us to build 114,000 units of various types of projects," he said, adding that critical mass was created from building affordable housing. "We get our profits from shop lots that are built near affordable housing projects," he said. SHAH ALAM: Sepang GoldCoast Sdn Bhd has signed a memorandum of understanding (MoU) with China-based Zhejiang Zhongxia Investment Co Ltd for the joint development of a new project in Sepang Gold Coast. Sepang GoldCoast Sdn Bhd is a joint-venture company between Permodalan Negeri Selangor Bhd (PNSB) and Sepang Bay Sdn Bhd. PNSB is the Selangor state investment arm while Sepang Bay is the Malaysian property arm of the Istana Group, a major property developer in Indonesia. Sepang Gold Coast is an international holiday resort in Sepang. Zhejiang Zhongxia Investment, based in Shanghai, is engaged in investment and development of leisure and commercial real estate, biotechnology and cultural artifacts. Zhejiang Zhongxia Investment executive director Xu Yong said the company would be involved in the construction and marketing of the new project in Sepang Gold Coast, comprising residential, hotel and commercial units with a gross development value of about RM1bil. “The planned construction of about 200,000 sq m is targeted to commence next year,” he told a media briefing after the MoU signing yesterday. Xu said that construction covering a total area of 47ha was expected to be completed within five to six years.“We are looking at Asian investors or buyers for the project,” he added. HONG KONG: Far East REIT, a hospitality trust launched by Singapore's largest privately owned property developer, started pre-marketing yesterday an up to S$700 million (RM1.76 billion) initial public offering (IPO), betting on demand from yield-hungry investors burnt by volatile global markets. With interest rates around the world hovering near record-lows, the fixed return on real estate investment trusts (REITs) are helping lure investors amid an uncertain outlook for equities. The MSCI World Index has fallen nearly seven per cent since its March peak because of concerns over Europe's debt crisis and China's economic slowdown. The REIT, which owns hotels and serviced residences in Singapore, is being marketed at a yield of 6-6.5 per cent, said a source with knowledge of the deal who was not authorised to speak publicly on the matter. The yield is slightly below the 6.63 per cent average for all REITs listed in Singapore. The IPO is set to be the biggest in the city-state so far this year. "It's still a relatively risk-averse environment, so REITs are something that people are looking at because they give good yields," said Wee Liat Lee, head of property research at BNP Paribas Securities (Asia) here. "Sentiment has been pretty sizeably affected by the slowdown in China recently, so the interest is diverted to Southeast Asia and Singapore as a capital-raising platform." The yield for the Far East REIT compares with about 7.9 per cent offered for Ascendas Hospitality Trust's deal this week and six per cent for CDL Hospitality Trust. By comparison, so-called specialized REITs that also bundle hotel properties traded at an average 6.6 per cent yield in Singapore, 6.7 per cent in Hong Kong and 7.4 per cent in Malaysia, according to Asia Pacific Real Estate Association (APREA) data. The REIT, sponsored by Far East Organisation, comprises seven hotels and four serviced residences in Singapore with about 2,500 rooms, the source added. The deal will come on the heels of Ascendas Hospitality Trust's US$304 million (RM957.6 million) offering, which had to be relaunched this week after the company was forced to remove one of the hotels from its portfolio. It will be a welcome development for equity capital markets in Singapore, where issuance plunged 74 per cent to US$4.7 billion in the first half of the year from the same period of 2011. The slump was much steeper than the 30 per cent decline in stock sales in Asia ex-Japan, according to Thomson Reuters data. Far East REIT and its bankers will start taking orders for the IPO on August 6, with pricing slated for August 15. The REIT is set to debut on the Singapore stock exchange on August 27. About half of the orders for the offering are expected to be covered by cornerstone investors, the source added. DBS Group, Goldman Sachs and HSBC were hired as joint global coordinators and joint bookrunners on the deal. This year's rally in stocks and bonds of mainland Chinese real estate developers looks set to peter out, analysts say, as valuations have become less attractive and hopes have dwindled for any rollback of steps taken to dampen home prices. The tide appeared to start turning during the past week, though China's property sector remains among the best performers across Asia this year, easily outpacing benchmarks. "The best performance for the China property sector is behind us and further gains will be difficult because of rich valuations and economic headwinds in the second half of 2012,' said Owen Gallimore, ANZ head of credit strategy in Singapore. "It is doubtful if people want to buy beyond the top-tier names and into the mid-tier after such a strong rally," he said. An index of property shares in Shanghai is up 17 per cent this year in contrast to the Shanghai Composite, which has drifted into negative territory and is currently near the year's lows. Valuations for the MSCI China real estate stock index have nearly doubled since the fourth quarter in 2011 when they hit a record low of just four times forward price-to-earnings. According to Deutsche Bank, a weighted index of 45 bonds from 32 property companies produced a return of 25 per cent in the first half of 2012, easily beating the 6.7 per cent total return for the overall JP Morgan Asian Composite bond Index. Some individual bonds have even beaten that. Shimao Properties' bond prices maturing in 2017 rose 66 per cent from the October lows. A rebound in transactions mainly from first time home buyers came as a relief for the property sector earlier this year, lifting it out of the funk it had fallen into by the end of 2011. According to Macquarie Capital Securities sales volumes in China's tier-1 and tier-2 cities on a four-week average basis bottomed out around February this year and have gathered pace after June. But as house prices were still in decline through this period and there was growing unease over China's economic slowdown, hopes grew that Beijing would rethink measures taken in the past two years to cool off an overheating property market. But now, with signs that home prices have bottomed out, the thinking is that Beijing is more likely to leave controls in place to forestall any rebound in home prices. After data released on Wednesday showed that China home prices broke eight straight months of declines in June, shares in the property sector began retreating faster. Investors are worried over how the government would respond should sales volumes stay strong and prices begin rising. LONDON: UK property businesses are hunting for bargains in the country’s battered real estate market, encouraged by heavy discounts that show how the eurozone crisis has hit confidence in the sector, Lloyds Banking Group said. Data from the bank’s quarterly Commercial Property Confidence Monitor showed the net balance of major businesses intending to make purchases in the next six months rose to 57 in May, from 52 in February, while the net balance of fund managers keen to invest rose to 38 from 36 over the same period. A net balance is the sum of all positive and negative survey responses which ignores the middle ground. A positive number, for instance, would indicate that there were more bullish responses than bearish ones. One survey respondent, a small company, told Lloyds that “property is so cheap people are starting to buy,” the bank said in the report. Lloyds managing director of corporate real estate, Lynda Shillaw, said there was clearly pessimism about the market’s near-term prospects. “Investors are nevertheless seeing the opportunity for longer term value growth when buying at today’s prices,” she said in a statement. UK property values fell 2% in the first half of 2012 and recovery was expected to be still far off due to the uncertain economic outlook, Investment Property Databank said last week. Despite the broader growth in investment appetite, Lloyds said most businesses expected activity in the UK property market to slow over the next six months, with the number of pessimists outweighing the number of optimists among small and medium-to-large businesses. A Reuters poll of economists predicted on Thursday that the eurozone has sunk back into its second recession since 2009 while a second poll said the British economy would stay in recession three months longer than previously expected.